Poirier wants to re-fix cancelled Duffy fight for 2 January in Las Vegas. 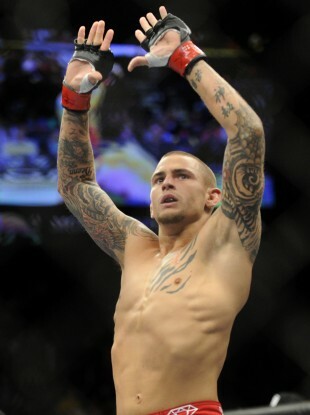 Poirier: No interest in fighting "small fish" Parke at short notice. DUSTIN POIRIER HAS ruled out the possibility of fighting another opponent at UFC Dublin this Saturday night. Poirier’s main event clash against Joseph Duffy was cancelled at short notice last night after Duffy sustained a concussion in sparring. A host of other fighters, including Norman Parke and Conor McGregor, offered to step in and take Duffy’s place at the sold-out event in the 3 Arena. Instead Poirier says he will wait to reschedule his showdown with Duffy, and suggested UFC 195 in Las Vegas on 2 January as an alternative. With Poirier and Duffy off the card, as well as the previously advertised co-main event between Stipe Miocic and Ben Rothwell, Paddy Holohan’s flyweight clash with Louis Smolka has been bumped up to the top of the bill. Antrim’s Parke, who is already set to fight Reza Madadi, said that he was offered the fight against Poirier but the American refused. “This was my team’s and management’s decision to let the small fish go and fight Duffy when he’s healthy,” Poirier said. Email “Dustin Poirier doesn't want a new opponent for Saturday's UFC Dublin card”. Feedback on “Dustin Poirier doesn't want a new opponent for Saturday's UFC Dublin card”.